On Saturday May 18th Nikki would have celebrated her 35th Birthday so the Trust would like everyone to mark this day in a positive way by holding a’ Nikki’s Birthday Tea @ Three’ wherever you are in the world. Nikki loved sharing cake and tea with her family and friends especially when served on her mismatched china. So why not remember our lovely girl by hosting your own ‘Nikki’s Birthday ‘Tea @ Three’. All you have to do is invite family, friends, and colleagues to a birthday tea hosted by you. Supply delicious cakes and plenty of tea and encourage your guests to give a donation to Nikki’s Trust. Nikki had family and friends all over the world and this is a great way for everyone to get involved wherever you live. Don’t worry about the time differences just arrange you tea for May 18th at 3pm. We would like everyone to upload pictures of their event to the Trust’s facebook page (coming soon) so we can all share in everyone’s different experiences. You may want to hold your tea in an unusual location so get creative, or like Nikki’s crazy aunt invite 50 people to your tea. Nikki’s mum, dad, aunt and uncle, ably supported by Pete and Chris will be on the final leg of the cycle ride for the trust from Paris to Farnham and will have their tea served by Shelly (Nikki’s sister) wherever they are at 3pm. (that could be interesting). If you would like to host a ‘Nikki’s Birthday Tea @ Three’ and would like to use some of Nikki’s favourite cake recipes, we are putting a few of them together and we will email them to you if you leave your details on the contactus@nikkistrust.co.uk . 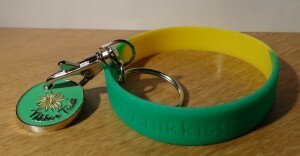 We will also be able to provide you with The Nikkis Trust wristbands and Trolley coins on a sale or return basis. (see the picture below) They are a £1 for each item so please contact us on the above e-mail address for more information. Nikki would have loved this event so please get involved celebrate the day and have some fun you know that’s what Nikki would want us all to do. Everyone was very generous and wanted to hear all about Nikki’s story.